Today’s fixer-upper is a special one, because I personally got the chance to peek inside of it last week while I was in upstate NY for the holidays. If you’ve been reading CIRCA for a while, you’ll know that I’m a big fan of the city of Newburgh, NY, which is on the verge of a major turnaround. This c. 1840 farmhouse is just outside the city, and was high on my list of houses to see while searching for my perfect house within 90 miles of NYC. It was all about the barns! The house is at 442 Fostertown Road, and is being offered for $250,000. This is definitely a fixer-upper in every sense of the phrase, but my gosh were Ethan and I in love! The outside is clad in vinyl, and the cornice is (I think) aluminum. All fixable! As for the interior? An absolute diamond in the rough. It’s warm, welcoming and the perfect size at just under 2,000 sf. The potential. The POTENTIAL! I got a warm, fuzzy feeling as soon as I walked in the doors. The right person would be VERY lucky to be able to restore this house, because all the bones are there to make it absolutely gorgeous. It almost hurts to think about it! Just below are the listing photos, but I got to take a lot more while I was inside, and I’ve included those further down. By the way, the realtor who showed us this house was Jean Wenz of John J. Lease Realtors. She’s wonderful and has lived in Newburgh for decades, so she certainly knows a lot about the area. Call her!!! The barns are beautiful. Honestly, the whole setting is just perfect. It comes with 4.7 acres of secluded loveliness, which includes some nice historic stone walls. Unfortunately, all I had on me was my iphone, so these photos that I took are a bit fuzzy. But they should portray some of the beauty of the interior. It’s not palatial, but it has that modest, old farmhouse feel that I personally love. Ready to roll up your sleeves? Check out the full listing HERE. 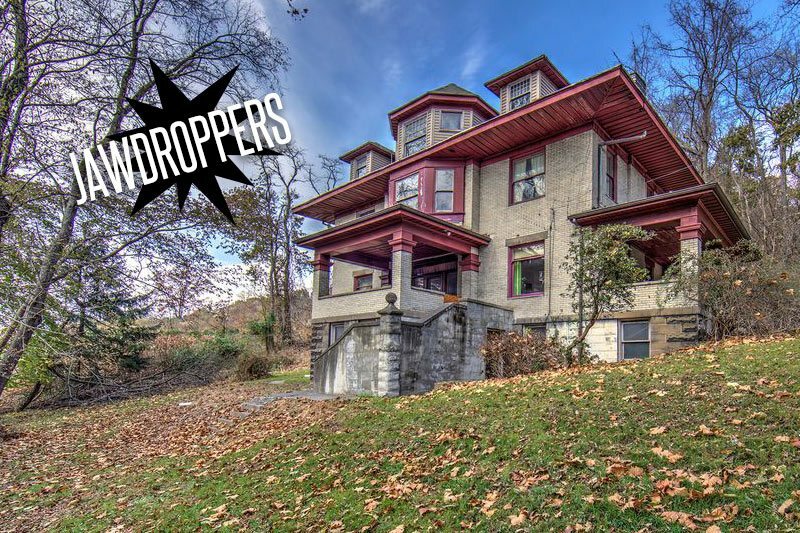 Friends have recently moved into a similar 1860s fixer upper on fostertown and love the house…! This looks similar! Really? I did see a bunch of other houses along the road that looked similar – I’d love to know which one they’re fixing! So many beautiful houses out there! Everything about that house is wonderful, especially that bay window– love it! ervin, I know! I love the bay window! As I was scrolling through I was saying oh gosh, gosh, and wow. If you buy it I hope the house comes with that large mirror by the stairs. Thanks for the extra photos that shows details realtors sometimes don’t photograph like the detail of the railings. Love the bay window and framing, doors and barn! My pleasure! Meet the Neighbors is such a great idea! Looking forward to more in the future. This reply went to my other email. I want a large mirror like this someday. Love this place! The bones look great – love the charm of the radiators and the cast iron (I’m assuming) sink and tub!!!! Katie, this is THE house! The one I want!!! We also seen pictures and fell in love with this home … Then we seen it today….On this 28th day of Febuary 2015 we fell in love even more and made an offer on this piece oh history.It was excepted… We are so excited and very lucky … if any one has any information on this historical home please share with us… Thanks and God bless. This was such a great find! My husband is checking this out for us today. We both would love an old farmhouse. Unfortunately, or fortunately, part of the renovations have already been done. I would love to put the big kitchen sink back in.